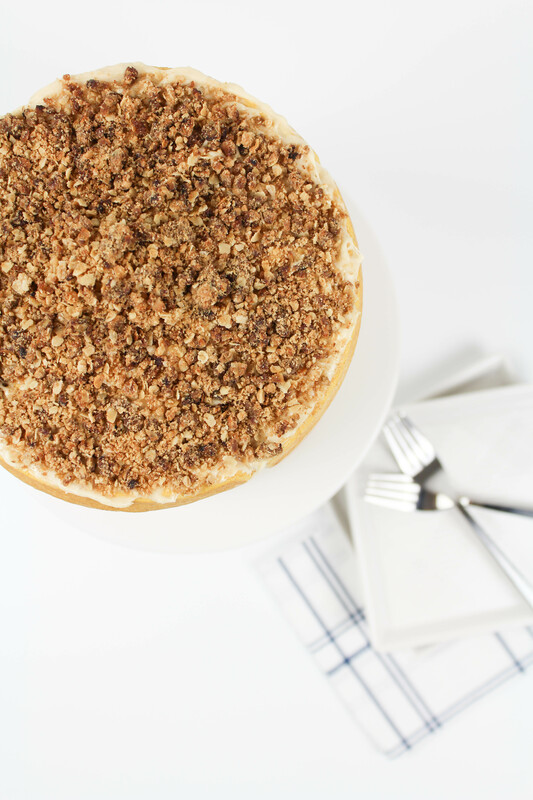 Guys, we’re talking caramel buttercream layered in between thick Belgian style pumpkin waffles, and then finished off with a yummy oat streusel topping. Oooooh, baby. First, preheat your waffle iron. In a bowl, mix the pancake/waffle mix, cinnamon, nutmeg and the brown sugar together, until combined well. In a separate bowl, add the pumpkin, milk and eggs together. Mix well. Combine the wet ingredients with the dry ingredients, and mix until combined and not lumpy. The batter will be thick and sticky. The amount of batter you’ll need to use will depend on the size of your waffle iron. I used an overflowing one cup for mine. Pour the batter onto your preheated waffle iron and cook until your waffle is ready. Remove the waffle from the iron and allow it to cool completely on a cooling rack. *This batter made 6 waffles on my iron. 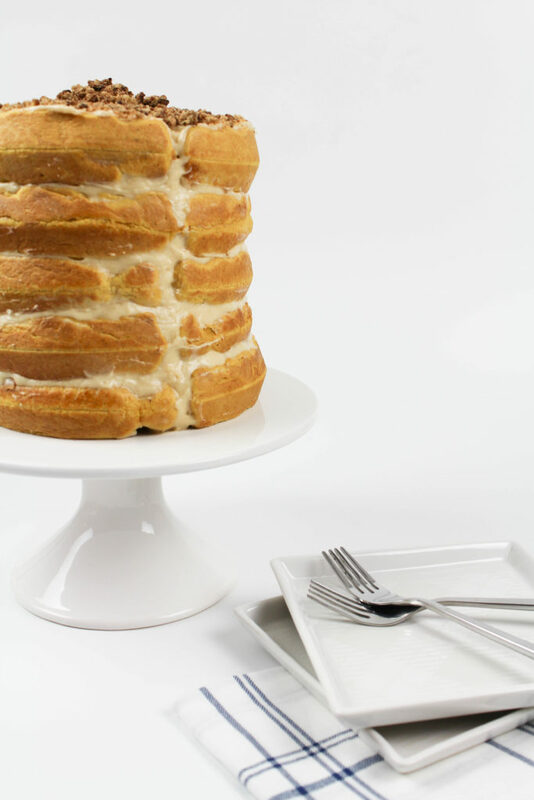 In an electric mixer beat the butter until it reaches a creamy consistency, on medium speed. Add the cream cheese, caramel and the vanilla to the bowl, and beat until all of the ingredients are mixed well. Slowly increase the mixer speed to high and continue to mix until the frosting is light and fluffy. Mixing on low speed, gradually add the confectioners’ sugar, one cup at a time, until it is well combined. Turn up the speed to high and mix until well combined and smooth. It should take about 2 minutes. 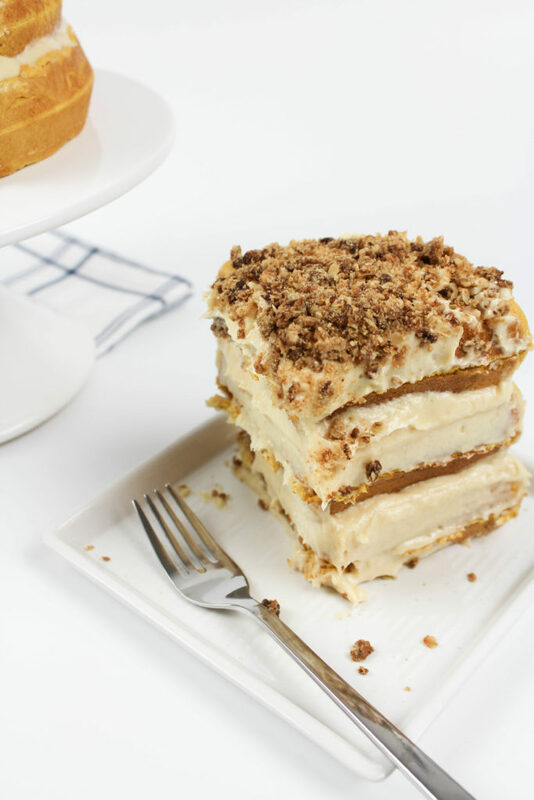 In a food processor, combine the flour, oats, butter, and brown sugar. Pulse until it reaches a combined, but coarse consistency. You don’t want the crumbs to be too small or fine. Lay the mixture out on a baking sheet. Bake for 15 minutes, then remove from the oven, and toss. 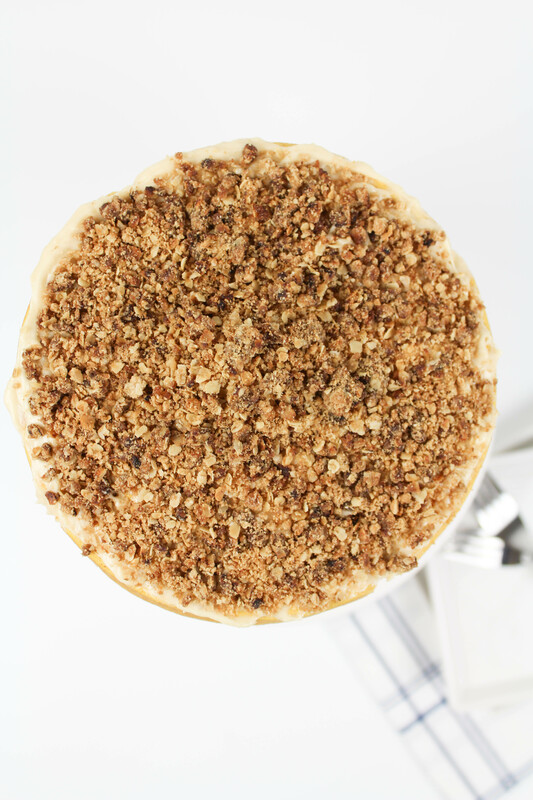 Place back into the oven and continue to watch until the crumble is slightly browned. 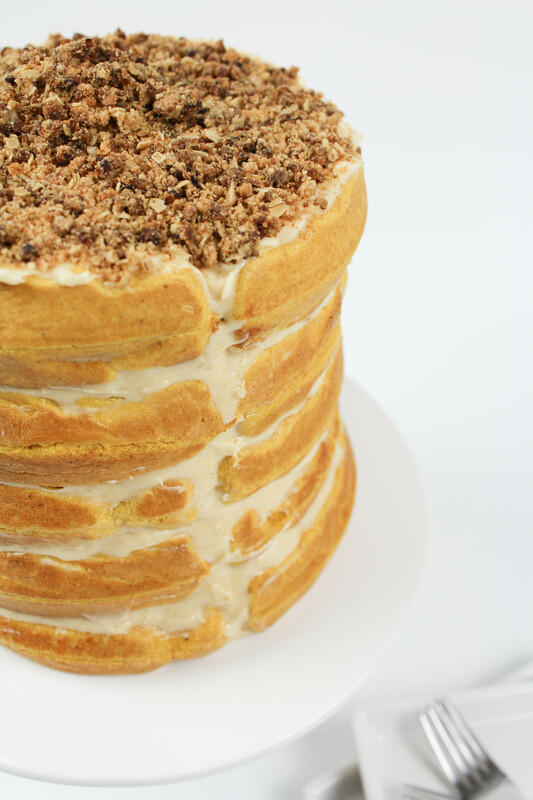 Next up, it’s time to stack your pumpkin waffle cake! 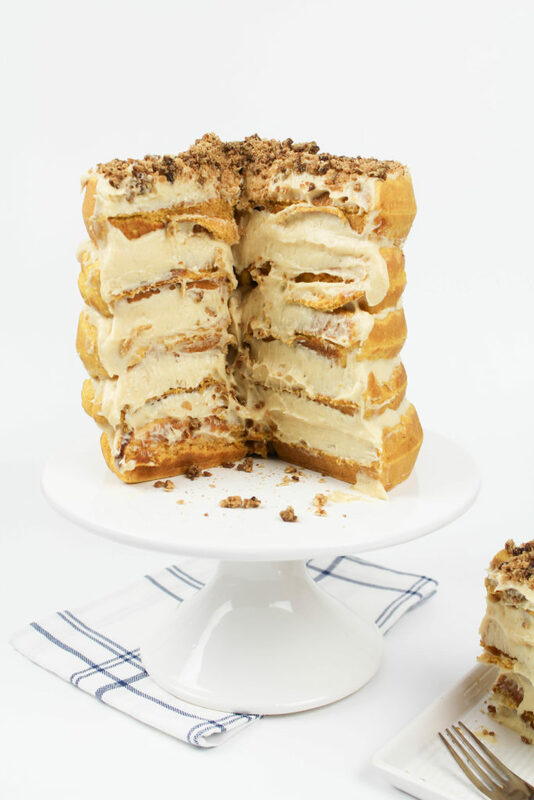 On a cake plate, pedestal, or serving dish, begin stacking your waffles and filling with the caramel buttercream frosting in between each layer. 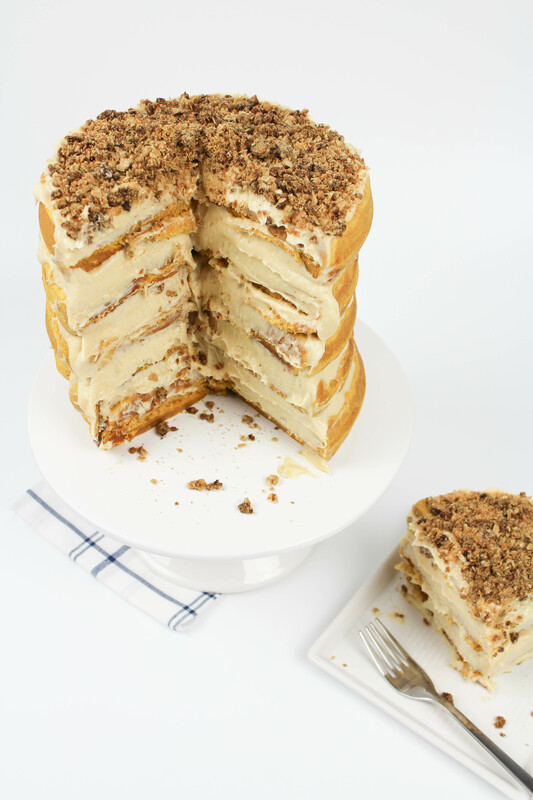 I did a total of 5 layers for my waffles cake, but you can make it as short or tall as you prefer. For the last waffle, top with a layer of the buttercream and smooth out any messy frosting in between the outside layers of waffle. Once you’ve cleaned up the outside, cover the top of the waffle with the oat crumble. The oat crumble topping adds the perfect texture to each bite of pumpkin waffle cake and really gives it that oomph it needs to take it over the top. You, my friend, are a genius. 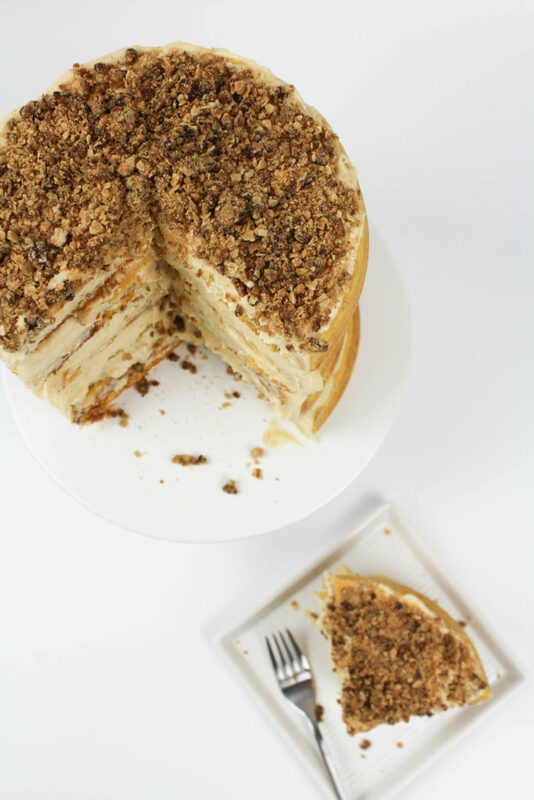 This is pure, delicious genius. My family is going to go NUTS when they see this!